Please call (318) 321-5463 or submit the Email Form for more information or to schedule an appointment. Dr. Layfield joined our practice June 8, 2016. She received her undergraduate degree in Pre-Professional Speech Language Pathology and Audiology from Louisiana Tech University. She completed her graduate degree in May of 2016 from Louisiana Tech University, after completing her fourth year residency at The Ear, Nose, and Throat Center of Shreveport in Shreveport, Louisiana. She enjoys spending time with her family and friends and traveling when the opportunity arises. 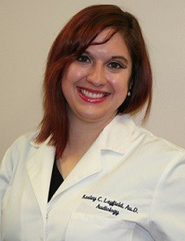 Dr. Layfield holds her Certificate of Clinical Competency with the American Speech-Language and Hearing Association and is a fellow member with the Louisiana Academy of Audiology.